I believe that having Emoji support would make the forums """better""". Because when ever I put a emoji (Smiley, B Button, Another B Button) it just vanishes. This might also happen with some Unicode characters but I haven't tested it that much. But they're not all 8 billion unicode characters. How am I going to paste Ancient Sumerian Characters or Mahjong Tiles (or many other unicode characters)? 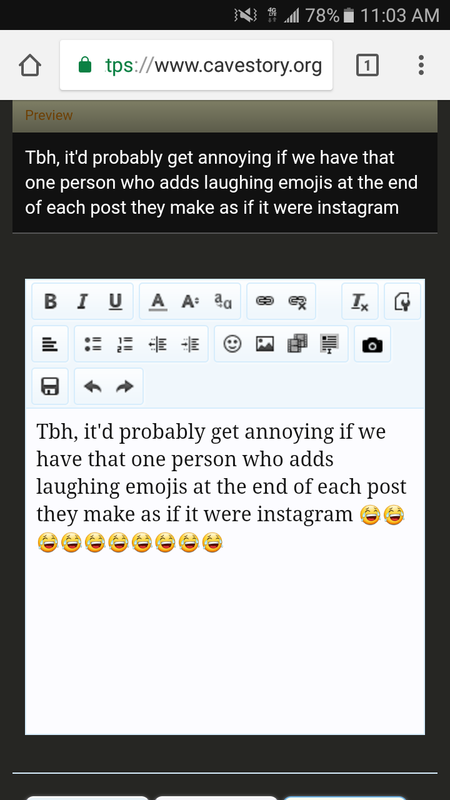 Tbh, it'd probably get annoying if we have that one person who adds laughing emojis at the end of each post they make as if it were instagram. To me it sounds like that's just a matter of getting bigger unicode support. But honestly for a forum I don't really think the need is that high. Also it could potentially cause security risks. Idea: for maximum memeing, add the B button as an emote. It shouldn't, if the software is written well. Why use :b: if you can just admire chinfish in all his glory? Because chinfish is funny, right? You've figured out my devious ruse.